The Cyclopes, also spelled Cyclops, are described as big men or giants with one eye in the center of their foreheads. The single eye is the Cyclopes' best-known attribute, although some early tales of the Cyclopes don't focus on the single eye; instead, it is their huge size and skill that is considered most remarkable--they are known to be physically very strong. They are also said to be able metalsmiths. Since they have only one eye, the Cyclopes are easily blinded. Odysseus blinded one so he could rescue his men from being consumed by the Cyclopes. The Cyclopes are born of Uranus and Gaea. There are usually three of them, Arges the Shiner, Brontes the Thunderer and Steropes, the Maker of Lightning. But other groups of Cyclopes exist. The Cyclops best-known from Homer's story of Odysseus was named Polyphemus and was said to be the son of Poseidon and Thoosa. The Cyclopes were imprisoned by jealous, insecure Uranus, who imprisoned these too-powerful sons down in Tartarus, a nasty underworld region. Cronos, a son who overthrew his father Uranus, let them loose but came to regret it and re-imprisoned them. They were ultimately freed for good by Zeus, who overthrew Cronos. They repaid Zeus by going to work for him as metalsmiths and keeping him well-supplied with bronze thunderbolts, occasionally branching out to provide Poseidon with his trident and a cap of invisibility for Hades. These particular Cyclopes were killed by Apollo in revenge for the death of Asclepius, though it was Zeus himself who was actually guilty of the deed. In Homer's Odyssey, Odysseus lands on the Cyclopes' island during his journey home. Unknown to them, they find respite in Cyclopes Polyphemus' cave and eat his sheep that is roasting over a fire. When the Cyclopes discovers Odysseus and his men, he traps them in the cave with a boulder. But Odysseus devises a plan to escape. When Cyclopes Polyphemus realizes he's been fooled, he throws large rocks at the men's ship. When visiting Greece, you are naturally surrounded by the stories of Greek mythology. On the coast of Makri, near the village of Platanos, is the Cyclopes Cave. The large boulders in the front entrance have been said to be the rocks the Cyclopes Polyphemus hurled at Odysseus' ship. Stalactites fill the three spacious chambers, one of which is on the upper level that you can access by a narrow hole in the wall. This cave-neolithic settlement was lived in during prehistoric times and later became a place of worship. 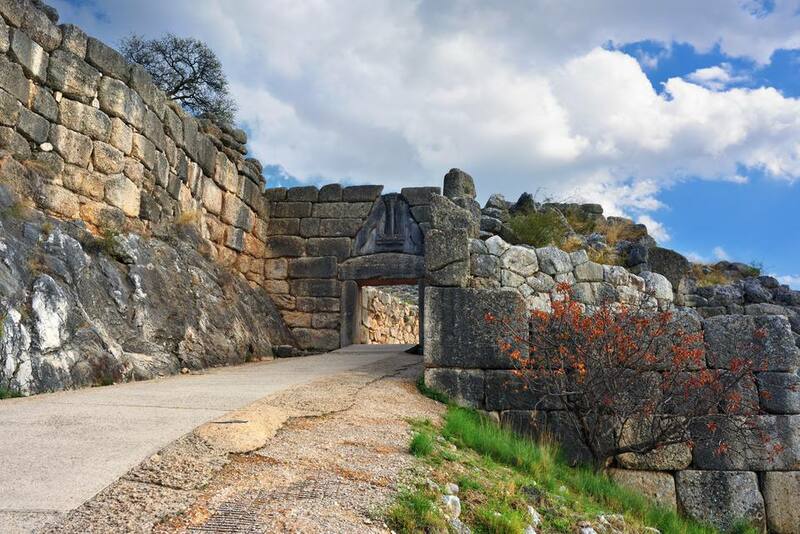 The Cyclopes are said to have built "Cyclopean" walls out of large stones at Tiryns and Mycenae, where they also built the famed Lion or Lioness Gate. There was a shrine to the Cyclopes near Corinth, which is not far from these two cities.